For years, I have wanted to try yoga. As someone who has suffered for most my life from chronic neck pain combined with a Type-A, high energy personality, yoga sounded like the perfect, dreamy fit to counterbalance my physical pain and bring about an emotional calming balance. As with every new endeavor, a busy life got in the way. During my working years, I’d rather use my free time to run or do other strenuous activities thinking that would help release some of my energy and fulfill me with endorphins. I ran long distance, downhill skied, traveled, hiked and did anything adventurous that made me feel alive. It worked to release energy and make me feel good yet the neck still ached and I still had difficulty handling stress. 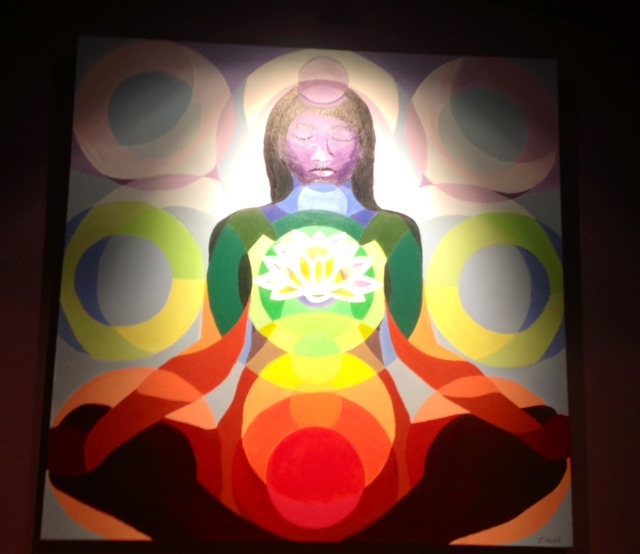 Photo of a piece of art painted by one of our yoga instructors at the Minneapolis Yoga Center. Next came the child-rearing years, where my neck and back ached once again, I had little sleep and hardly any time for myself. I forgot about my longing to try yoga and placed it on the back burner once again for years. Being a stay-at-home mom who didn’t have to be at a desk all day on the computer seemed to alleviate some of my neck pain, however, once I started writing a lot and spending hours on the computer the neck and back pain came back. I realized it was there to stay no matter what kind of physical therapy, pain medication or icing I did. I have suffered for almost 30 years (it began at the tender age of 13) and it was only getting worse. I worried about aging and what on earth I’d do when I was 50, 60, 70 and 80. At the age of 41, I felt like I was an old lady sometimes who could hardly sit up straight in a chair without pain. This fall when the kids began school full time and I finally had more than three hours to myself a day to do what I wanted, I again thought about starting up yoga. But for some reason, life got busy again and I felt I had no time to add something new my daily routine. That is, until I was hit with one of the most stressful, anxiety producing times of my life: My father’s cancer diagnosis. The first time he was diagnosed early this fall I felt like the world was coming crashing down upon me. My body ached insanely bad, my head felt like it was going to explode, my stomach stung and I could hardly sleep a wink. The stress and anxiety of the situation and uncertainty of what his diagnosis meant left me falling into a downward spiral of utter despair and anxiety. I was basically a train wreak. I continued on at a stressful pace, embracing my work and keeping way too busy so I wouldn’t have time to think and continued this lifestyle for months. On the outside, I looked like I was doing great but on the inside I was physically, mentally and emotionally falling apart. Slipping slowly into a place I didn’t want to be and a place I’d been before when I suffered severe postpartum anxiety after the birth of my first child. I knew I wasn’t in a good place and finally was able to pull myself out of it little by little. But inside I knew that I was in a dangerous situation. I needed to find peace and someway to calm me down. That is when I finally took the first step and tried yoga. Two weeks ago, I went to the yoga studio and have been going almost every day ever since. I honestly do not know how I would have gotten through the terrible news that my father’s cancer had spread without yoga. Yoga has changed my life. It has brought me balance and peace. Calmness, understanding, power and strength. It also has brought me a sense of spirituality that I was lacking before and can relate to. I am very connected to nature yet am not religious one bit. The teachings of yoga and the spirituality all make so much sense to me and correlate to who I am and who I want to be. It has been an amazing journey so far to learn so much about myself and see the inner strength and harmony I have within me. I am so grateful that I have found yoga and meditation as a way to nourish my soul and make me a better human being. But most of all, I am so grateful that I’ve found a strength to give me hope, power and encouragement to get through the challenges that we face throughout our lives. Nicole, I’m so glad you’ve finally found yoga and meditation and they’re helping you get through the tough times. Take a look at this website http://www.myyogaonline.com Sending you a big hug from Thailand. Thanks Lucy! I will check this out. I’m off to Arizona tomorrow to see my mom and dad. My brother and sister will be there too. It should be good to finally go and my dad is finally starting chemo tomorrow too. I am so glad you found this as well Nicole. Like you, it took me far too many years to find yoga and meditation. Now I do not know what I would do without them. I’ve been going almost every day. I need to. Only thing that is keeping me sane right now! This entry was posted on November 21, 2013 by thirdeyemom in BODY, MIND & SOUL, Healthy Living, Illness, Inspiration, RANDOM THOUGHTS, Yoga and tagged cancer, coping, Family, healing, hope, NaBlaPoMo, relaxation, yoga.